First, let me say thanks to The Gluten Dude for calling my attention to this video clip from Chelsea Lately. While I do find some of her skits funny, this one wasn’t doing it so much for me. Now, would I feel differently if she wasn’t directly making fun of something I and our son deal with? Perhaps. So what is it that she was poking fun of that has me annoyed? Maybe you can guess if you follow me on Facebook because I’ve posted the petition online this past week… the Disney episode that got pulled from video on demand where the gluten sensitive child was made fun of for his food allergies, and in fact, the other kids even threw a pancake in his face during the episode. Ok friends, here’s where I get out the soap box for a sec. Yes, I can admit that some might find the skit below funny, and under the right context (as in, not making fun of a cause that so many of us supported because it means something to us) I can appreciate the humor. But as if to put salt in the wound, Chelsea Handler announces that she’s “supposed to be gluten free” but eats bread anyway because she either doesn’t mind that she feels like crap when she does, doesn’t value her health or is just plain too weak to resist it. Whatever the reason, I don’t particularly care. What I do care about is the message she’s sending to those of us who do take our health seriously and more importantly that of our children: that it’s ok to eat gluten now and then if you’re allergic – you can just pay for it afterwards. Here’s the clip for those of you who care to watch it. I will say the “He makes me look macho” line is great. But then she goes on to say that those of us who take gluten-free seriously need to “shut the f–k up”. And compares being gluten-free to being vegan. One is a choice made based on a moral consciousness which I completely respect, while the other is based upon a physiological health condition that can kill you. Hmmm, a bit different in my humble opinion. I don’t know about you, but I had most if not all of those throughout my life until I removed gluten. And these are certainly not things I want my son experiencing. Not only are they unpleasant in the moment you’re dealing with them, but they lead to long-term nutritional deficiencies, anemia, respiratory issues, Candida overgrowth, leaky gut, adrenal fatigue, and various other auto immune disorders. And what some of my NCGD friends can handle (such as wheat in their beauty products, for example) I can’t tolerate. I know some other gluten sensitive folks who are able to eat gluten now and then, though they’ll be the first to admit they race to the bathroom afterwards and spend the night feeling like crap. 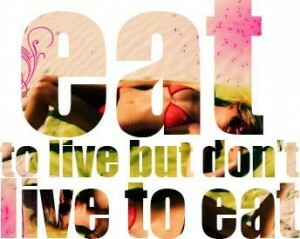 So for me, I skip it because nothing is worth me feeling like crap, you know? 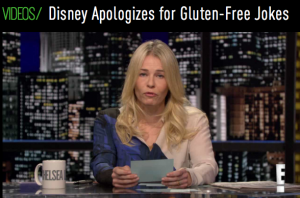 If Chelsea Handler has such little willpower or desire to stay on a healthy track for her own good, so be it, but to use her fame and public persona to state that it’s no big deal to eat gluten when you have a sensitivity and mock the “pancake in the face Disney episode” is just plain wrong. Danielle of Against All Grain has done it again! 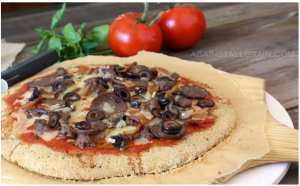 This time she has come up with a grain free pizza crust that claims to be delicious, and to hold up against its gluten and grain-full competitors, unlike some of the other grain free crusts we’ve tried which don’t allow you to pick up and indulge in a little slice of pizza heaven. She tops her with some of the delicious and healthy meats from US Wellness Meats, though we left the toppings up to you on this one, so go ahead and indulge in your favorites. Some of ours include goat cheese, spinach, garlic and tomatoes. Another fave is sauce, ham and pineapple. And yet another is the meat lovers favorite with proscioutto, sausage, ground beef and jalapeno. Truth be told, top it with whatever fresh and delish toppings you want and simply enjoy the ability of savoring pizza again on a grain free diet! Add in the almond flour, coconut flour, baking soda, salt, and garlic granules, then process the mixture for 1 minute. Add the eggs, almond milk, apple cider vinegar, olive oil, and water and process for another minute. Scrape down the sides of the bowl and pulse a few more times until you have a very smooth dough. Let the dough rest for 2 minutes to let the coconut flour absorb some of the liquid. Remove the top piece of parchment and carefully slide the other piece with the crust onto a pizza pan. Top with sauce and your favorite toppings and bake for another 10-15 minutes. « Coconut Oil – what’s the hype? 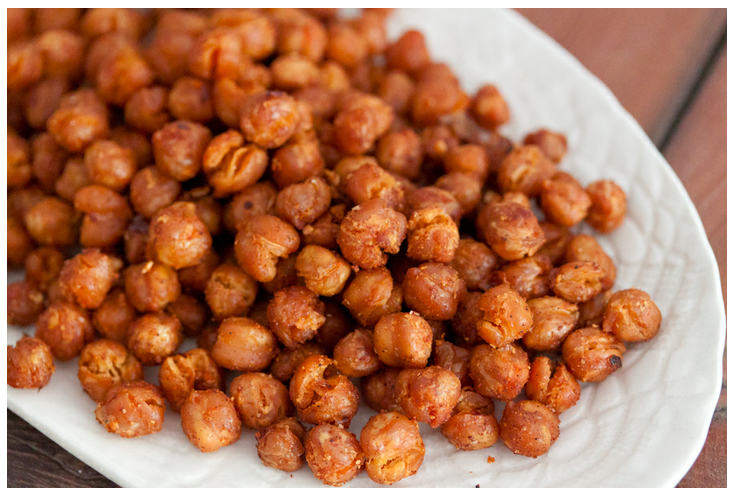 Sometimes I miss the salty crunch of chips, pretzels or crackers, so when the urge kicks in I turn to these guys; roasted, spicy chickpeas. They’re a tasty, easy to make treat and I typically have all the ingredients in the pantry. I discovered the recipe on What’s Gaby Cooking and I have to admit, I love the warm, spicy, toasty, salty combo! 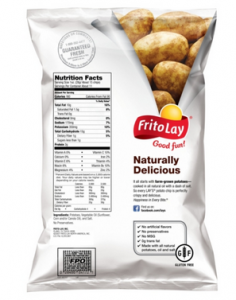 They make a great snack on their own, or as a side dish to your fave main course. All you need is 30 minutes, a can of garbanzo beans and some typical household spices. Kick up the heat for those of you with a flair for spicy. Enjoy! Drain and rinse the garbanzo beans in a large colander. Continue to rinse until all the foamy liquid goes away. Line the counter with a few sheets of paper towel. Place the drained garbanzo beans on top of the paper towel and let them dry for a few minutes. Once the beans are dried, place them on a parchment lined baking sheet. Drizzle with olive oil and then sprinkle on the spices. Using your hands, toss the beans around so they are all fully coated. Place the baking sheet in the oven for 20 minutes and all to roast. After 20 minutes, remove the pan from the oven and give the beans a little shake and then place back into the oven for another 20 minutes. Season with salt if needed once fully roasted and then serve. I don’t know about you, but one of the things I tend to crave when the cravings hit (and I should mention that they don’t come very often when you follow the paleo diet) is chocolate. So I was so happy to run across this tasty, guilt free treat to help satisfy those cravings when they hit! 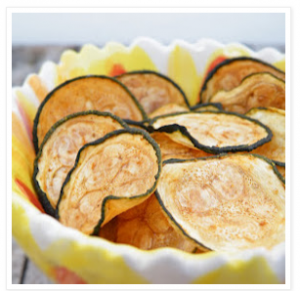 I was browsing some of my fave sites today and ran across a new one so I can’t yet vouch for these, but they look delish and after reading a bit about the site’s owners and browsing their other recipes, I’m pretty excited to give this one a shot! 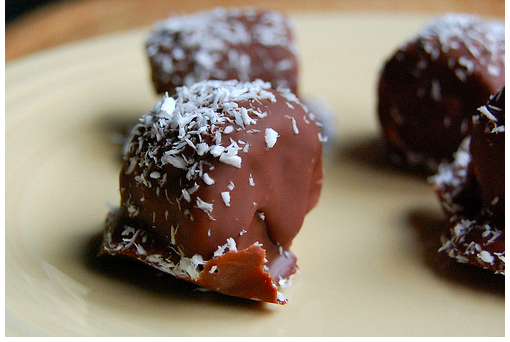 Note that you can make them vegan by using dairy-free dark chocolate – yum! You can enjoy them right after they're made (but they aren't frozen yet -- and when they're frozen, the banana tastes like vanilla ice cream). I suggest then covering with some plastic wrap (or really you can do all of this in some kind of Rubbermaid container) and let them freeze overnight. Last week I read an article on USA Today that Domino’s has announced they are offering Gluten free pizza in some locations, and I thought that was a pretty big deal. Definitely a step in the right direction for those of us who miss our pizza, right? Perhaps…. 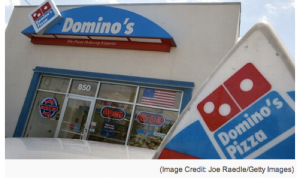 “Offering Domino’s Gluten Free Crust is a big step for us, and we wanted to make sure we were doing it right,” Domino’s CEO J. Patrick Doyle said in a statement.“The prevalence of gluten sensitivity has become a real issue with significant impact on consumer choice, and we want to be a part of the solution,” he said. Although the crust is gluten-free, the company only recommends that those with a mild gluten allergy enjoy the pizza. It doesn’t recommend the crust for those with Celiac disease because it can’t fully guarantee the product hasn’t come in contact with gluten. This is an important point that made me take notice as most people I know aren’t just a little sensitive to gluten. In fact, there is little known as to whether someone with Non Celiac Gluten Sensitivity can tolerate small amounts of gluten. I’ve heard some people claim to be able to, however, I know personally I can’t handle any cross contamination, though I lived a lifetime of the damaging effects (wasn’t diagnosed until I was in my mid 30’s) so perhaps my son (who hasn’t eaten gluten since he was 4) would be ok with a little cross contamination here and there. Or perhaps not. I don’t really know. But it’s certainly something I was surprised to see the National Foundation for Celiac Awareness endorse. Anyway, just beware that you may not fare so well due to cross contamination issues and be careful before you over indulge. The pizza costs $12, about $3 more than a regular pie. One slice of a 10-inch pepperoni pie has 170 calories, 3.5 grams of saturated fat and 410 milligrams of sodium. •Casual dining. P.F. Chang’s, an industry standout with 25 gluten-free dishes, just added seven more to its menu, including Gluten-Free Caramel Mango Chicken and Gluten-Free Asian Tomato Cucumber Salad. It also uses gluten-free soy sauce , which is the key to making these dishes taste as good as conventional dishes, says Dan Drummond, brand director. •Beer. Also Monday, Anheusher-Busch will roll out Michelob Ultra Light Cider, which is gluten-free. In 2006, it launched Redbridge, the first nationally available gluten-free beer. Well, it’s a sign that things are moving in the right direction for us! We just need to be careful to note the reality of the impact gluten has on our compromised bodies, and how important it is to manage our health. 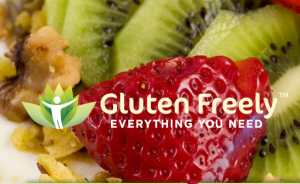 I urge you not to get too excited about the abundance of gluten-free products available to us now; beware of how you’re feeling and take note if you have an adverse response. It took me a little while to realize that cross contamination is sometimes an issue for me; my symptoms are typically gas, bloating, fatigue and headaches. Other responses you may be having are related to cross- reactive issues which I’ve outlined a bit here. So please – share your thoughts, opinions, ideas, etc. too! The more we learn about how we each successfully manage our food allergies and sensitivities, the better lives we lead. Are you gluten-free, but still want to enjoy some of the sinfully delicious recipes you were used to, such as P.F Chang’s Mongolian Beef? Well now you can! 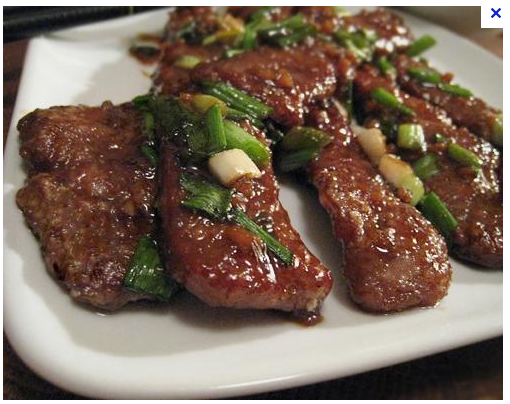 Here’s a recipe for PF Chang’s Mongolian Beef (one of my hubby’s faves) as prepared gluten free. 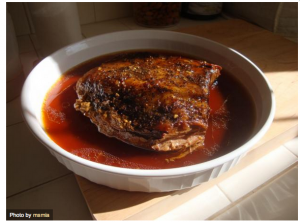 Easy breezy, this brisket recipe is a no-brainer for an easy and delish dinner option. 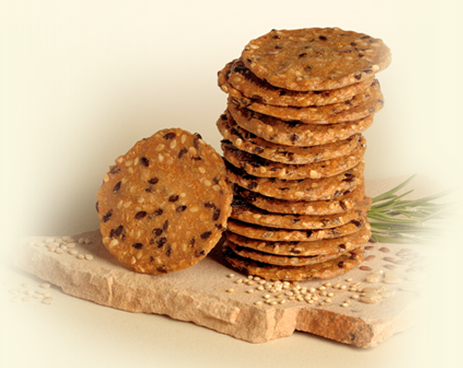 With the use of Braggs Aminos, its not only paleo but gluten-free friendly too! So grab the crockpot, set it on simmer and come home to a house filled with the amazing aroma of brisket. We enjoy this with mashed cauliflower, but asparagus, broccoli or any other fave veggie are great as well.